Dolomiti Energia Trento recorded its first-ever road win in the Eurocup Last 32 by downing Pinar Karsiyaka Izmir 79-85 on Wednesday. 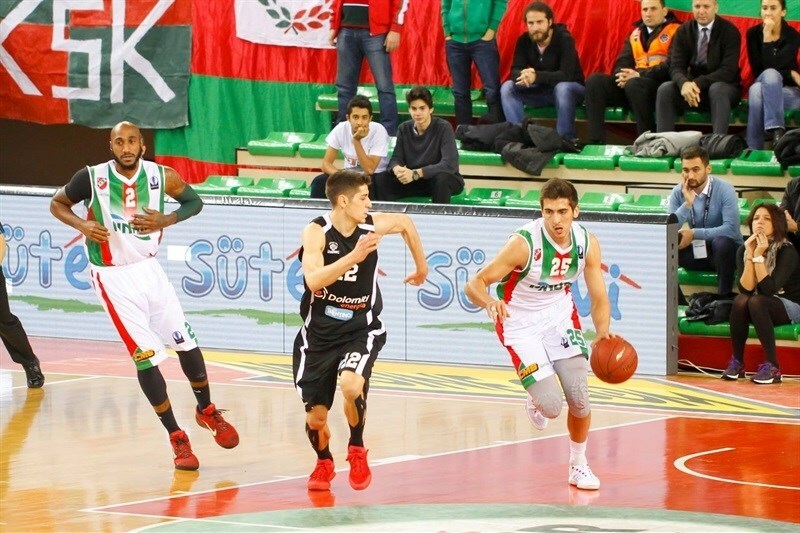 Trento improved to 2-1 in Group K while Karsiyaka dropped to 1-2. Both teams will meet again in Trento next week. Julian Wright led the winners with 26 points on 11-of-13 two-pointers, 7 rebounds and 7 assists. Davide Pascolo added 16 points and 8 rebounds, Diego Flaccadori had 13 points while Dominique Sutton and Trent Lockett each had 10 for Trento. 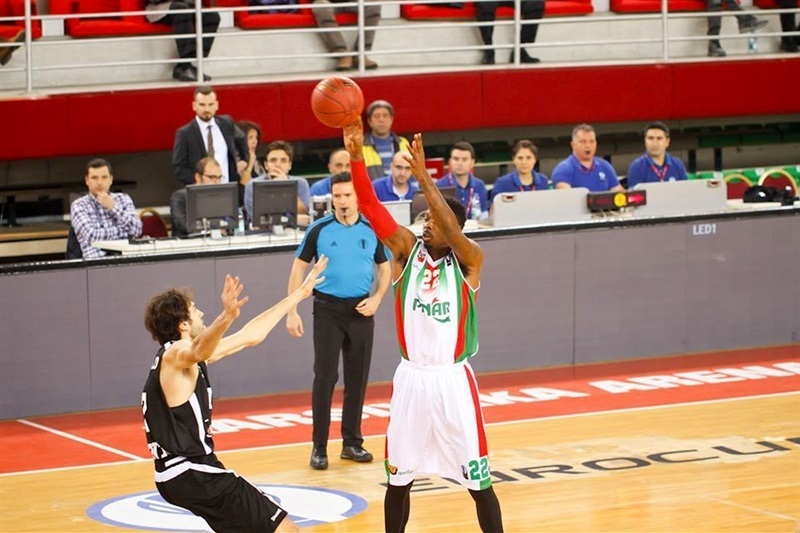 Bracey Wright led Karsiyaka with 26 points and 7 assists. Justin Carter added 13 while Josh Carter had 11 for the hosts, which finished the game with 21 turnovers. 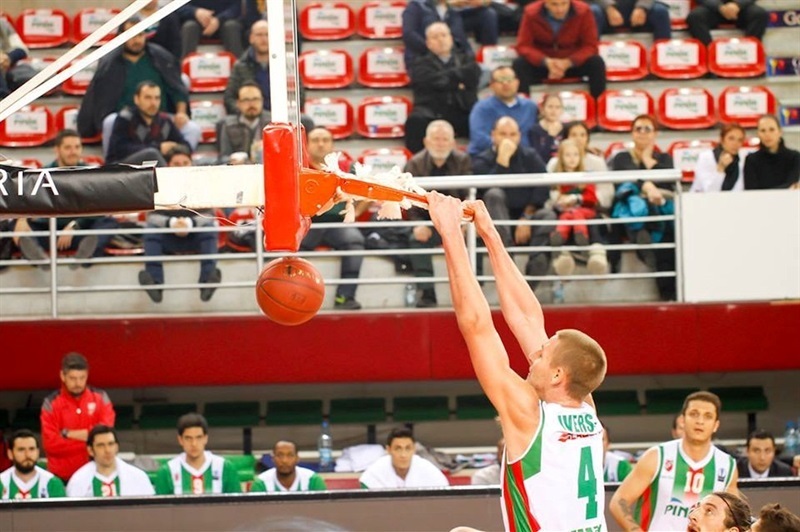 Colton Iverson and Kenan Sipahi shined early and a three-pointer by Josh Carter gave Karsiyaka a 18-13 lead late in the first quarter. Lockett had 5 points in a 0-10 Trento run that put the guests in charge, 18-23. 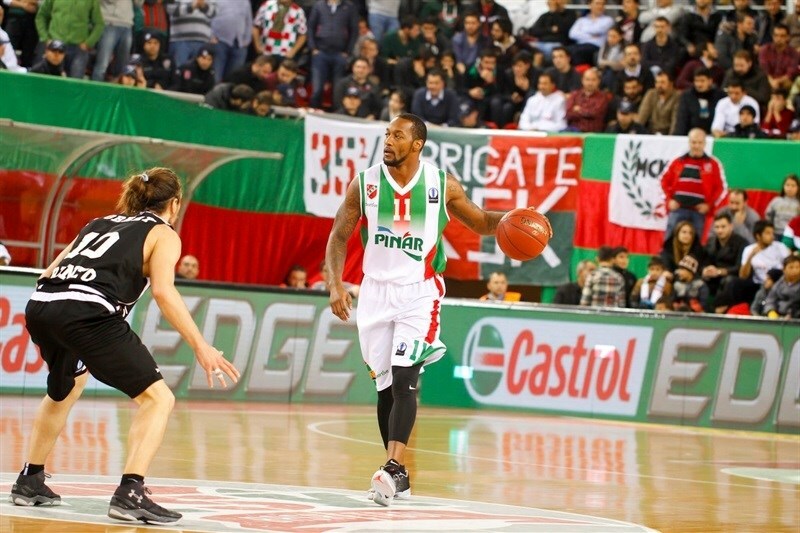 Wright and Josh Carter fueled a 10-0 Karsiyaka run that made the hosts regain the lead, 28-23. A three-pointer by Sipahi gave Karsiyaka a 38-36 edge at halftime. Karsiyaka led 48-39 right after the break but Wright and Sutton quickly erased the deficit, giving Trento a 60-62 lead after 30 minutes. Wright stayed unstoppable and got help from Pascolo and Lockett to lead the guests to a very important road win. Wright got Trento going with the opening basket and Flaccadori added a triple for a 0-5 lead. Karsiyaka went scoreless for more than 3 minutes until Iverson had 4 points in a 6-0 run which gave the hosts their first lead, 6-5. Pascolo and Wright exchanged baskets and Wright put Trento back in charge, 8-9. 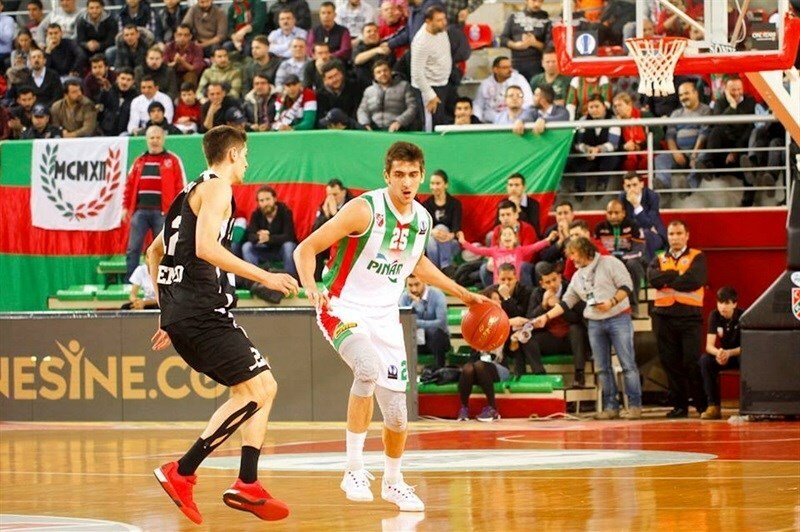 Sipahi made free throws and Wright scored again for a 12-9 Karsiyaka edge. Wright scored again but Kenny Gabriel did better with a triple. Sutton took over with a two-handed slam and even when Josh Carter nailed a triple, Filippo Baldo Rossi answered from downtown to keep the guests within 18-16 after 10 minutes. Trent Lockett had quick points early in the second quarter to make Trento get a 18-23 lead, after a 0-10 run. Wright rescued Karsiyaka with a three-pointer and a layup-plus-foul by Josh Carter put the hosts back ahead, 24-23. Wright scored again and Kerem Gonlum capped a 10-0 Karsiyaka run to give the hosts a 28-23 lead. Baldo Rossi and Justin Carter exchanged baskets and Pascolo allowed Trento to get within 30-29. Wright stepped up with another basket and Gabriel added a one-handed slam for a 34-29 lead. Flaccadori followed a triple with a basket and Pascolo added a layup but Sipahi beat the halftime buzzer with a triple that pur Karsiyaka back in charge, 38-36, at the break. Trento struggled to score after the break and Justin Carter allowed Karsiyaka to get a four-point lead, 41-37. Wright tried to change things with a quick basket but Wright found Gonlum for a layup, Iverson shined with a three-point play and Justin Carter forced the guests to call timeout at 48-39. Flaccadori stepped up for Trento with a triple and a free throw by Sutton gave Trento hope at 48-43. Gonlum scored again but Wright brought Trento even closer, 50-47. Baldo Rossi dunked and a reverse layup by Sutton completed the guests' comeback, 50-51. 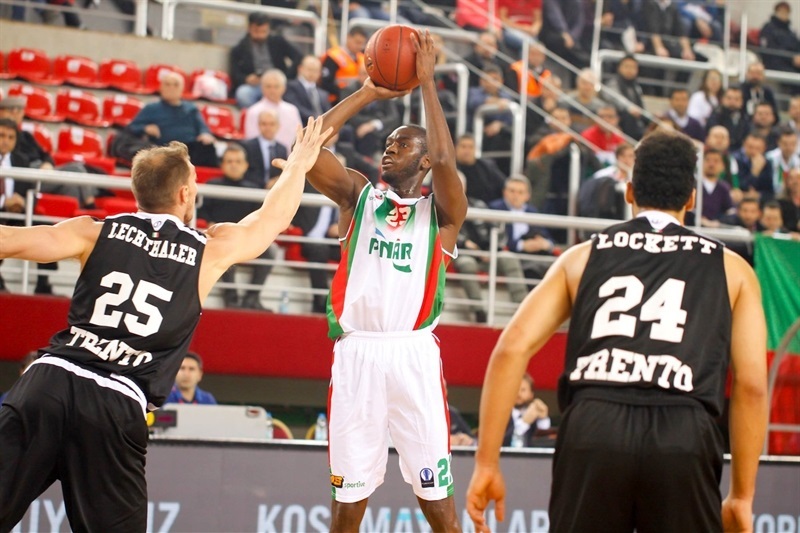 Josh Carter downed a triple and Wright added a jumper to give Karsiyaka fresh air at 55-52. Wright scored again and free throws by Flaccadori put Trento back ahead, 55-56. Pascolo downed a jumper that Wright improved with a triple. A layup by Sutton gave the guests a 58-60 edge after 30 minutes. Pascolo hit a couple of technical free throws early in the fourth quarter but Gabriel kept the hosts within 60-62. Wright shined with a big slam and Lockett beat the shot clock with an eight-meter bomb that boosted the guests' lead to 60-67. Josh Carter and Wright exchanged baskets but Karsiyala kept missing open shots. Meanwhile, Wright swished a six-meter jumper that made the hosts call timeout at 63-71. Gabriel shined with a put-back slam and a three-pointer by Toto Forray seemed to seal the outcome, 65-74, with 4 minutes left. Wright and Justin Carter, however, brought the hosts within 73-76 with 2:39 left. Sutton took over with a fast break slam and Lockett scored again but the hosts kept their chances open, 77-80, with 48 seconds left. Pascolo nailed a turnaround jumper and a dunk by Wright allowed Trento to start celebrating a pivotal road win.